Tweet With MySQL Cluster it is possible to aggregate data from many MySQL Servers using Replication. Here is how. E.g, you might have a sensor network, where each sensor writes data into a mysql server. The problem is that you have a quite few of these sensors, and you want to do aggregate this data, e.g. in order to do data mining on the combined data set. 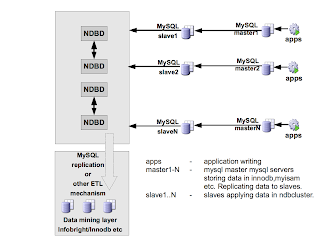 The standard MySQL server does not support multi-source (i.e, one slave server can be connected to many masters), but Cluster can be used for this, since you can have many mysql servers connected to Cluster acting as slaves. It is also possible to extend this - e.g, to replicate the aggregated data from Cluster to e.g, Infobright for datamining. Installed MySQL Cluster on the host computer (called barracuda)- I used the MySQL Cluster 6.3 slave medium sandbox. The Cluster is going to act as a slave collecting data from two master mysql servers. The sandbox I am using comes with two mysql servers that are acting as slaves in this setup. In each VM (server01 and server02) I installed one mysql server. 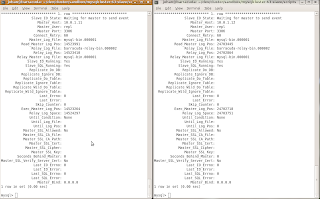 These two mysql servers are acting as masters. test@server01: src/bencher -s /tmp/mysql.sock -t 1 -l 10000000 -q "INSERT INTO sensor(sensor_id,data) VALUES (1, <1024B of data>)"
test@server02: src/bencher -s /tmp/mysql.sock -t 1 -l 10000000 -q "INSERT INTO sensor(sensor_id,data) VALUES (2, <1024B of data>)"